Fittingly I had this post fully composed and was cleaning up the formatting in the Blogger WYSIWYG in Chromium when the browser page jumped back and I lost it all…maybe I brushed the laptop touch pad and it interpreted it as a gesture action. Don’t know. This current build of Chromium seems jumpy. I had the same thing happen on some general web-page browsing as well. So my new blog posting process is to compose fully in WLW (at least that works). Then copy/paste into the Blogger WYSIWYG editor. Using anything but Chromium. We’ll see how that works. So what I was trying to post is that these past two days have been filled with struggling against a series of random events during normal pc maintenance around the Valca home. I spent several hours last night working on updating Lavie’s Dell Inspiron laptop; mostly Windows updates and third-party browser updates. Then I went through her “Programs & Features” and worked though each of those seeing if they had updated versions. Many did. So I took care of those. I discovered that while the WiFi was working normally again under Win 8.1, the “Dell Wireless WiFi + Bluetooth Driver” install package listed in “Programs and Features” was corrupted. I couldn’t remove it. I wanted to be sure I had the installer package on hand in case a future Win 10 upgrade borked it again. Luckily I both found it - Dell Wireless 1703 WiFi+ Bluetooth Driver Driver Details – and was able to use it to do a repair/reinstall to get it on clean again under Win 8.1. While I was doing all this work Lavie’s laptop seemed sluggish. In fact it has seemed that way to me for some time (Lavie shrugs) and I’ve been considering upgrading it to a SSD drive. I was monitoring the performance using System Explorer’s process tree and Task Manager graphs but not really seeing any clues. Then I opened up Resource Monitor and focused in on the file activity. I was shocked to see that the process that was doing all the file reads/writes was Classic Shell. To see if this could be responsible I closed out Classic Shell and the system sprang to life again. It seemed much more responsive and snappy again. Lavie is going to see if the system seems better with Classic Shell after all the clean up work and then with it turned off before she considers letting me disable/remove it. I’ve also followed this tip to add a semblance of a Start – All Programs list to the task bar. It’s a great tip and one I like to do for our Win 8.1 tablet users. That service work alone on Lavie’s laptop should have been enough for the weekend. However, I ran into a new round of issues on my workbench laptop this morning. First off, VMware Workstation Player offered me an update to 12.1.0. Sure. I tried a few more times with no success. I then downloaded the setup file directly from VMware and tried an install with the /clean switch but it said it couldn’t find an installed version. Checking the Windows Services found a series of VMware related services that were “present” but looked like they were marked for deletion. I walked though this VMware KB: Cleaning up after an incomplete uninstallation on a Windows host KB but wasn’t finding any remnants at all of the previously working installation. So it looked like it had been taken off ok. So I just rebooted the system and indeed the VMware service items were gone. I tried the installer again with fingers crossed and the installer went on smoothly and the app ran again with no issues. 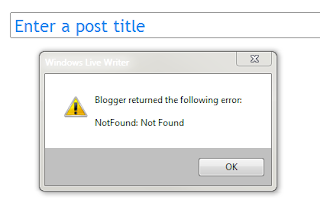 Windows Live Writer Goes Open - Hurray - WLW breaks - Booo! Well I was all set to excitedly post news about the announcement that Windows Live Writer has gone to an Open Source project release. Only I got an account/password error during installation when configuring it up to the Blogger system. Turns out it looks like Google has timed it's depreciation of the WLW authentication method so it now will not work. The reason it's not working is that a few years ago Google deprecated the authentication process that Live Writer uses, i.e. Google declared it as obsolete because it is not secure enough for the modern web, and developers should stop using it ASAP. Unfortunately Live Writer was not updated to use the new more secure OAuth 2 standard. Google removed support for it back in about May this year, then temporarily re-enabled it for Blogger / WLW, now it looks like they have pulled it for good. It's not straightforward to fix, certainly more than a couple of lines of code. If you want to comment, please post to the GitHub issue via the link above, as that will be read by the developers. They will not generally be following the MS forums as it's no longer an MS product. This could not have happened at a worse time given how many bloggers rely on the holiday season for income. It seems that Google has taken the release of this product as a green light to finally deprecate the legacy auth leaving Blogger users stranded. The initial excitement I had at a new WLW release...even if missing spellchecking at this stage was heavily tamped down with the breaking of the original WLW posting to Blogger. It's not clear to me yet if other alternative blogging clients that can interface with Blogger will also hit that brick wall. I'm composing this post in the Blogger web page UI but that won't do for regular posting. So until this sorts out -- please be patient while the blog posting at GSD slows down. Clearly I’m finding a little bit of time in the post Thanksgiving Day period to catch up on some blogging. Here are some new browser bits I’ve tucked away over the past several weeks. FavIcon Reloader - Add-ons for Firefox - having two primary systems, and two Mozilla based browsers (Firefox and Pale Moon) means that my considerable bookmark library often gets out of sync. I don’t use an on-line sync solution but rather back-up/restore the file between apps/systems. That’s great but I loos my favicons if the difference. FavIcon Reloader works great to get the icons back. I tend to use them as visual clues a lot more than I realized. Firefox finally comes to iOS - Ars Technica - meh.. It has been a long time since my Case of the Unexplained Donut of Death post where I dip into the deeper waters of Windows Performance troubleshooting. But eventually I hit upon the Windows Performance Analysis Toolkit in Windows 8 (SDK 8) and newer (Win 8.1 & 10). See this GSD post for linkages to more tool tips for the above items. Later I would find an additional tool PerfView that helps with trace file collection and analysis. Now Windows 10 is out and while I really need to invest in a deep dive of a resource like the Windows Performance Analysis Field Guide (amazon link) by Clint Huffman, there are still a lot of tools and resources still to be discovered. I’m still trying to understand the new feature set and capability of Windows Performance Toolkit for Windows 10. The latest tool that has inspired me is Bruce Dawson’s “UIforETW” tool. This is a tool that records ETW traces, works around ETW performance bugs, allows configuration of trace recording options, works as a trace management UI, and more. Basically you download it, run it, allow it to install the required WPT packages, and then pretty much start tracing. It records to a circular buffer so if you experience something interesting, save the trace and rename/note it, and the trace keeps on going while you go exploring the captured trace file. Read Bruce’s post for a full walk-through. ETW Central - Random ASCII - round-up post collecting all of the linkage and key bits for ETW usage. Random ASCII | Forecast for randomascii: programming, tech topics, with a chance of unicycling - Bruce’s blog home page. UIforETW - GitHub - download page to get the latest releases. Bruce also has some good posts on performance troubleshooting. This is an awesomely helpful tool to keep on your USB drive! Both the ETW tool and the PerfView tool in particular should make it easy for me to leave a shortcut on a user’s desk so they can run the tool if I need them to capture a recurring performance issue, then let me collect the (large) trace file at a later time for deeper analysis. However it would be nice to make a scripted “click-to-run” or “circular capture at startup” routine for ongoing troubleshooting; assuming resources (disk space and system performance) are up to the task. I’m looking at these posts for inspiration and refinement. Of course, just being able to collect ETL trace files and look at them with the Windows Performance Analyzer tool isn’t remotely close to fixing the issue. Generally there aren’t any singing angels present pointing the way to the problem process or issue. You have to deep dive into the trace file to isolate the issue and drill down into the root cause; then come up with a solution. So here are a BUNCH of video resources (and a few blog posts) to help with the learning process and to illustrate the tools mentioned and techniques used in Windows performance troubleshooting. I’m collecting them here so I can find them quickly when I need some inspiration or deeper learning. Improving performance with the Windows Performance Toolkit - YouTube - Michael Milirud //build presentation. That should keep us busy for a while! I found these the other day while working on a project at work. Want to learn network security fundamentals? In this MVA course, discover the building blocks of modern network design and function and prepare for Exam 98-366: Networking Fundamentals, part of an MTA certification. Our online network security training course is free of charge and led by an expert who can help you build your skills and career. Take this networking fundamentals training, and find out how to put the many pieces together to build a functional and secure network. In this module you’ll learn about basic concepts and Local Area Networking. This module describes the OSI model and how its layers determine how network traffic is moved and consumed. This module covers the basics of wired and wireless media, protocols, standards, and concepts. In this module you’ll learn about Internet Protocol (IP) and how it makes the internet and modern networks function. This module describes the tools used to manage and troubleshoot networks. This module describes the services that can be provided and that are required for a network to function. In this module you’ll learn about connecting your local area network to other local area networks over large geographic areas and across multiple types of boundaries. This module show you how to appropriately use the tools described in earlier modules to build a functional, secure network. The information in this module provides you with an opportunity to dive deeper into Networking Fundamentals, at your own pace. Another version perhaps or same one repackaged? Taught by educators with attention to the needs of school teachers and students, these courses address Local Area Networks (LANs), network definition using the OSI model, wired and wireless networks, Internet Protocol (IP), TCP/IP in the command line, networking services, wide area networks (WANs), and much more! This module provides an overview of the Active Directory roles available in Windows Server. This module provides an overview of Active Directory Domain Services in Windows Server. This module provides an overview of Active Directory Certificate Services in Windows Server. This module provides an overview of Active Directory Federation Services in Windows Server. This module provides an overview of Active Directory Rights Management Services in Windows Server. This module provides an overview of Active Directory Lightweight Directory Services in Windows Server. With this Microsoft Technology Associate (MTA) Training course, you can prepare for MTA Exam 98-367. Build an understanding of security layers, operating system security, network security, and security software. The course leverages Microsoft Official Academic Course (MOAC) material for this exam. Get an introduction to the topics of authentication, authorization, and accounting—what they are, how they are different, and how each is implemented and managed. Look at available options and how to use some of the tools in Windows for implementing each one. Hear about security policies and how they may work in an organization. See how policies provided by Group Policy can prevent unauthorized access to an organization's resources. A network can be the most vulnerable part of an IT infrastructure. Learn some of the methods and options for securing these invaluable assets, and gain from a discussion of firewalls, Network Access Protection (NAP), protocols, and wireless networks, from a security standpoint. Learn about protecting the physical assets in your organization, including servers and clients—and the software running on them—and how to secure them. Do you know how cybercriminals work? Get helpful insight, in this cybersecurity course. As an IT Pro, you know that the computer threat landscape is continually changing and that increasingly sophisticated attacks are targeting your organization's infrastructure and confidential information. Walk with experts through social media platforms to discover how they really work. Get tips and practical advice on social networking security. Plus, explore methods of developing a secure baseline and how to harden your Windows Enterprise architectures and applications from pass-the-hash and other advanced attacks, and look at system patching. Finally, learn how to help improve your organization's security with Microsoft operating systems and tools. Learn about how the computer threat landscape is continually changing and how increasingly sophisticated attacks are targeting your organization’s infrastructure and confidential information. In this eye-opening journey, venture into the very heart of social media platforms to discover how they really work. Get tips and practical advice on social networking security. Explore methods of developing a secure baseline and how to harden your Windows Enterprise architectures and applications from pass-the-hash and other advanced attacks. Learn how Windows Clients are ready to mitigate some of these attacks and how you can utilize your security skills. Do you patch your systems? How often? Do you know why you should take action against patching your systems? Find out, in this helpful module. Learn how to improve IT security with Microsoft operating systems and tools. I have two Windows 7 Pro x64 systems up at the church-house that refuse to comply and install IE 11. I keep reviewing the install log at C:\Windows\IE11_main.log for failure analysis and all the requirements seem to be present, but it still fails; both via Windows Updates or a manual (re) installation of all the pre-requisites and the main IE 11 install file. This is from just one of the two machines I’m having the same issue with. I need to pull the second system’s IE install log and compare to see if they match. I suspect they will. It doesn’t matter if I run either the manual IE 11 installer package or the Windows Update obtained package…results end the same. I’m cleaning up the log file and picking only some of the key lines from it for brevity. iexplore.exe version check success. Install can proceed. Updated Download list, Hardware Blocking list, and no reboot policy files successfully downloaded and extracted for use. Launched program to check hardware: "C:\Windows\TEMP\IE1924.tmp\IE11-SUPPORT\IEXPLORE.EXE" /CheckHardware "C:\Windows\TEMP\IE1924.tmp\IE11-support\HardwareBlockingList.xml"
Hardware support check succeeded. Installation will continue. Prerequisite download processes have completed. Starting Installation of 9 prerequisites. PauseOrResumeAUThread: Successfully resumed Automatic Updates. Setup exit code: 0x00009C57 (40023) - Prerequisites failed to install. I had tried to manually install each of the prerequisite files and don’t remember having any issues though I seem to recall when getting to KB2834140 it said it wasn’t required/needed on the system and exited. The key clue is “exit code 0x800F081E (-2146498530)” which I understand means "The specified package is not applicable to this image". Maybe I’ve got the system looking at and pulling a corrupted WSUS update? Anyway…I’ll be coming back to this with a fresh post soon. Chasing down possibilities from these error codes quickly becomes an Alice in Wonderland adventure. Likewise, at work found that some of our Surface Pro 3 tablets just don’t want to pull updates down from the WSUS. Normally when a system is “stuck” getting updated WSUS patch delivery we might escalate getting it going (after confirming it is correctly pointing in the Registry) by first doing a “gpupdate /force”. I know. If that doesn’t work we next try the following. If failing that, this routine comes. Rename the software distribution folder (i.e. C:\Windows\SoftwareDistribution). Only that still didn’t work on the Surface Pro 3’s. I really hoped not to reimage the systems as a “troubleshootin” solution as that is a lot of work and user impact so…I managed to get them working thusly. I had checked the C:\Windows\WindowsUpdate.log and found a particular error that came up after each “manual” update refresh attempt. That led me to this solution. Fix Windows corruption errors by using the DISM or System Update Readiness tool - Microsoft Support. Since it was a Windows 8.1 system I ran the following command. It found an error with an AMD-related update package component (go figure) and repaired it. After it completed, I did a system reboot and the updates have flowed faithfully since. If you have a Windows 7 system, then you can use this System Update Readiness tool. None of those have helped with my IE 11 installation issue but with IE 8 (that it is stuck on since IE 9-10 also won’t go on) retiring soon, I’m determined to get it fixed once and for all. One of the smaller pleasures in life that Lavie and I share are watching the BBC short animated series “Sarah and Duck”. Alvis is long-gone from the nest but the animation and crack-storytelling of this series is addictive. We keep coming back from more. There is a card game that Sarah and Duck often are found playing called “Same Bread”. When I grew up we played a variant called “Snap”. The thought is you take turns laying cards from your pile and when a match (same bread picture) results you yell “Same Bread” and slap down on the cards first to win the pile. So what has this to do with anything? And this week Dell’s card came out; pardon the mess but it was a messy round…they actually played two cards in this game. Note that I’ve tried to order them from most technically helpful/detailed downward. If you just want to check/fix the issue on your Dell system, jump down to the bottom of the list. https://dellupdater.dell.com/Downloads/APP009/eDellRootCertFix.exe - direct download link to Dell’s provided removal tool. That post by Martin Brinkmann has a review/link to RCC to scan the Windows Certificate Store and detect potentially questionable certs. You will have to carefully research and decide on your own if any should be removed. RCC - check your system's trusted root certificate store - Wilders Security Forums - forum thread with lots of details on the utility. Sven Faw - website download page of the RCC developer. Check out also his “CTLInfo” app. It is portable and GUI based and can show/report on the Windows system’s Root Certificate Trust List. Added to my utility collection. Microsoft also has some helpful info. I noticed the other day when snagging the latest Adobe Flash Player update from the Adobe binary download site that they will be removing most access to the “standalone” Flash Player download files. That really bites as it is a great way to bypass all the nonsense with third-party app installs during your Flash installs/upgrades for friends and family. On my own systems I have Flash Player set to notify me of new updates but to not install them automatically. I’ve yet to see a notification from the app that a new Flash version is available. I’ve also gone back to check on systems that I manage Flash manually on for others and find that they do have the latest Flash version already -- and a third-party application (usually a tool bar helper or security application) installed that came along with the update ride that the user didn’t catch. And under the revised access system, you will need to have an active Internet connection to access the on-line update download. Adobe Flash: From January 2016, the bloatware-spin ... Borns IT and Windows Blog (Google Translated). Adobe wants to restrict further distribution of the Flash player - heise online (Google Translated). I’m not sure yet if some of the trusted third-party download sites I use will continue to be able to offer just the binary files for access. I prefer to get my binaries directly from the source, but that isn’t an option after January 22nd. And these might not be available either. Then there is this tweet tip from Aral Balkan that basically reminds us we can often use the F12 developer tools to emulate (user-agent switch to) an iPad or other mobile device with our browser. That may get us “Flash” content that is available if you don’t have Flash installed. Malwarebytes has recently (11/23/15) released a new version of their Malwarebytes Anti-Exploit protection software. Current version is now 1.08.1.1045 and should auto-update eventually. If it doesn’t or you just don’t want to wait, go download the package and over-install it to upgrade your current version. They have also released a new version (8.0.1) of the Junkware Removal Tool (JRT) which was recently acquired. I like this as it is a fast, focused, and portable tool to remove and repair a number of malware/ad-ware/junkware/PUP focused programs. It is one of the “first-strike” tools I deploy against a heavily infected system I may be servicing for a friend or family member. Load up and carry on! So when this Helge Klien post came in this week with it’s incendiary lead-in, I had to pay attention. Gpupdate /force is for wimps! Reapplies all policy settings. By default, only policy settings that have changed are applied. That is quite telling. Group Policy keeps track of what has been applied and does not reapply settings that are already present. Nice! So why would we override this optimization? We would not. Using /force typically is only required when your Group Policy infrastructure (i.e. AD and/or DNS) are broken. Go fix it instead of telling poor old Group Policy to forego optimizations! That got me digging just a little bit deeper into the whole gpupdate /force thing we do and tell others to do without consideration. GPUpdate or GPUpdate /force? Learn the difference! - DeployHappiness. GPUpdate /force: Reapplies every policy, new and old. So which one should I use? 99% of the time, you should only run gpupdate. If you just edited a GPO and want to see results immediately, running gpupdate will do the trick. In fact, running GPUPdate /force on a large number of computers can be damaging to your career. This is because these machines will hit a domain controller and reevaluate every GPO applicable to them. Note: If you are looking for the remote version of GPUpdate in Active Directory Users and Computers, see this guide. Since you asked, why yes there is! GPUpdate has a few other options for you to use. /LogOff: Certain GPOS, such as Folder Redirection, can’t apply in the background. If a logoff is required, this switch will initiate it. /Boot: If a policy, such as software installation, needs to be applied – the boot command will reboot the machine. /Sync: Useful for changing the foreground (startup/logon) processing to synchronous. I didn’t mention it in my last post but after I had reassembled the laptop and brought it back up, I had lost my network connection. After some quick troubleshooting I was sure that I had messed up my WiFi card. I could connect via an Ethernet cable and was OK, but try as I might I could not get WiFi going. Weird thing was that the card hardware was showing up in the device manager with no errors and reported to be working properly. Even though the WiFi router is less than 3 feet away from my desk, maybe the antennas got messed up during the reassembly? I shut the laptop down and opened up the bottom access panel, pulled the WiFi card, removed and inspected the WiFi antenna connections and card posts. All looked OK. I reassembled everything, checked the BIOS settings at reboot; normal. After some more time meditating, I realized the “issue”. I hit the button on the keyboard to turn the WiFi on and it was working again. Some Dell laptop systems (like my Latitude at work) use a mechanical switch to toggle on/off the WiFi. Other Dell systems (like my Studio and XPS models) use a dual-use function key. On my home systems there is no LED indicator to show that the WiFi has been disabled. Then in the resulting dialog window, select the network connection(s) and using the green arrow on the right, change them in order up or down accordingly. Only this time, that still didn’t seem to help. The system just wants to camp out on WiFi even when the wired is available and set as the preferred order. This Super User question/answer session has a nice listing of alternative options you can try. Right click on your Wifi Network Adaptor usually titled "Wireless Network Connection"
Disable then Enable back Wireless Network Connection. So that’s the reason why I had turned it off; the Studio laptop really has a hard time choosing the (better) wired Ethernet connection for network usage over the WiFi. So I just had forgotten that I was still toggling it off manually when I am hooked in on the wired connection. So now I just need to make a mini sticky note to remind me now what mode the WiFi setting is in. Like one of those dishwasher signs you flip over that say “Dishes Clean / Dishes Dirty”. Micro-update on last weekend’s Well that was unexpected: DVD stuck in slot-load drive post. I got tired of trying to creatively extract the DVD out of the slot-load drive this week. A front had blown through and the wind/rain was borderline torrential so it seemed like as good a morning as any to tear apart my Dell Studio 1558 laptop to pull the disk out. With my handy Studio 1558 Service Manual loaded up on an iPad next to me I set to work on the teardown. It took me about an hour of careful screw-tracking and ribbon-cable unlatching, but I did finally get the DVD module removed from the system. One out, I removed a little chassis mounting bracket on the side of the DVD module, then four screws removed from the lid and it was popped open and the DVD (just the one -- no double-stack was found) was out. I didn’t see any obvious issues but this module is now suspect so it won’t be fed again. I put it back in the system for now. Reassembly was fairly tame and went faster, though I took my time with the connectors and snapping all the plastic clipped sections together properly. Mom is a crafter/beader so she had given me a sweet little felt-covered shallow sorting tray with lots of compartments. I used it to keep track of my screws during disassembly. Each step the screws went into their own divider. You can just make it out in the top of the first photo under the flipped over palm rest component. I have a nice mini-driver set from many many years old (probably older than Alvis). It works great but I think it will be time to invest in a upgraded mini-driver kit -- iFixit Pro Tech Screwdriver Set (Amazon.com) & probably also this iFixit Pro Tech Toolkit (Amazon.com) as well. I’ve done more laptop teardowns than I would like over the years and my current tools get the job done, but this time I found myself using one of Lavie’s soft plastic citrus peelers as a spudger and connector pry/seat tool. It worked but the plastic was a bit soft for the task. I picked up this LG External DVD Rewriter SP80NB60 around town. it was slim and light and cheap and uses a tray-load system. I won’t be testing to see if the internal DVD module is still OK but I don’t know if I am going to replace it either with another internal unit. Time will tell. My otherwise cheer-filled weekend hit a snag Saturday. After two weeks of smooth sailing on my Dell XPS laptop powerhouse running a Win10 installation, Win 10 totally blew out again. Really really bad. I eventually gave up on the Windows 10 self-repair as that only led to a wheel of misfortune game of what will the new blue-screen ;( error message show this time. It was ugly. I then bailed and decided to do a roll back to my Win 7 Ultimate OS which was still present. Only that hung up and eventually got me a Windows 7 loading to blue-screen error loop. I couldn’t find my Windows 7 Ultimate x64 setup disk so I popped a blank DVD in my Windows 7 x64 Dell Studio 1558 system and made a recovery disk to use. Only the DVD appears to have gotten stuck in the drive slot. It’s a slim slot-load DVD for this model so no paper-clip and tray tricks here. Eventually I found my Win 7 Ultimate x64 setup disk after all and even though I got an error during reloading the last good System Restore point, the system booted up to my previous Win 7 OS pretty much intact. I had to install some Windows updates all over again, and reinstalled a few applications, but is is now back in order. Windows 10 is now Verboten! on our Dell laptops for the foreseeable future. With that crisis averted, I’ve turned to trying to extract the DVD from the slot load drive. So I’ve been doing recon on how the slot-drive mechanisms work in the hope I can then extract the stuck DVD using a set of custom engineered extraction tools I’ll have to develop. This seems to me to be the best hope right now. The drive spins and the mechanism makes the ejection sounds. The DVD just won’t pop out. The system can read the disk fine so the reader and spindle are OK. the little metal tab drops down that keeps the disk from falling out. Maybe the center hole on the disk is a bit small and jammed stuck on the spindle? I’m hoping I can pop the DVD off the spindle then use double-stick tape with a thin piece of strong aluminum to pull it out. Failing that I may have to pull the drive out of the laptop. I’m not bothered by the disassembly but would rather not have to. Have anyone tried one of these kits? I could possibly not replace the DVD drive but buy a custom caddy to accept a 2nd HDD or SDD. The Studio 1558 only accepts a single drive bay but this would get me room for a 2nd drive. I’d probably go with a SSD based on heat/cooling concerns and power-draw. Is is worth the effort? I like the concept but have my worries. I’m open to advice and suggestions to try! Visio 2013 and Visio Stencils issue (Fixed) - Erik Bussink - Great tip for a really backward option application to re-enable opening of VSS files in Visio 2013 if the permissions are jacked up. Office 2013 Administrative Template files (ADMX/ADML) and Office Customization Tool - Microsoft download - contains the Microsoft Excel 2013 workbook, Office2013GroupPolicyAndOCTSettings_Reference.xls. TIP: If you don’t want to install the tool, just unpack the download EXE and then snag the XLS file for referencing the Group Policy settings.